1. Print out the sugar glider patterns onto card stock and make copies. Instant Digital Download $ 2.00, three pages - - Includes body patterns without lines and with lines for writing. 2. Have your research sugar gliders, look at pictures and then color the patterns to match the pictures they studied. 3. 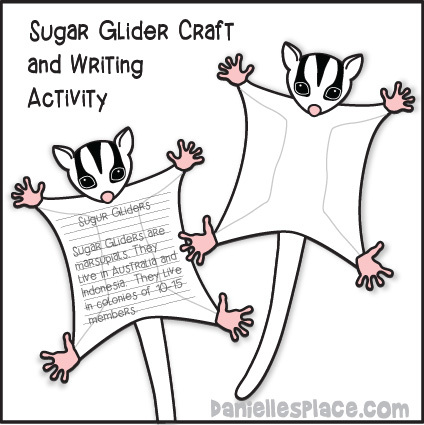 If you are using the lined sugar glider pattern, have your children write facts about sugar gliders. 4. Tie a string on the back of the sugar glider bodies and hang them from the ceiling so it looks like they are gliding through the air. 1. Roll one legal-sized piece of paper up into a tube that is about two inches wide. Tape it closed in the middle and ends. 2. Roll a second piece of paper over the first one to make the tube stronger. Tape it closed with clear tape. 3. Press one end together, fold it up 1/2" and staple it closed. 4. Cut newspaper into long strips that are about five inches wide. 6. Remove the twisted paper from the marker trying not to let it unwind. 7. Place the twisted paper into the tube. Do this three times to fill up the tube. Tip: If you have very young children, you can just have them crinkle up small sheets (3" x 3") of newspaper and place them in the tube. 9. 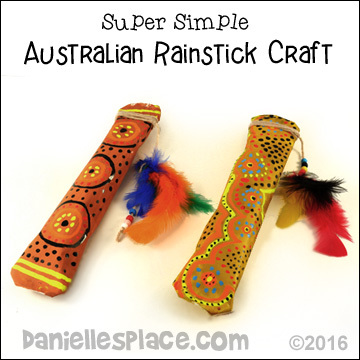 Have children paint the rainsticks and then use liquid paint markers or paint brushes dipped in paint to paint a dotted design on the rainsticks. 1. 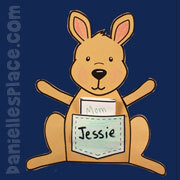 Draw legs and ears on a piece of card stock, color them and cut them out. 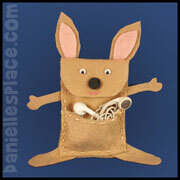 (A printable pattern for the ears, and legs are available to members and as an instant download. 3. Glue the ears to the head. Glue the legs on to the top of one of the paper plates and then glue the two large paper plates together. And then glue the head to the body. 4. Cut yarn into six inch pieces and glue them inside the mouth. Use these books to supplement your homeschool unit studies on Australia. 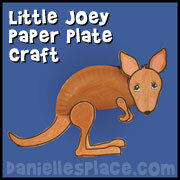 Use this craft to reinforce your homeschool unit studies about Wombats or Australia. 1. Read stories about wombats (see above) and look at pictures of them online. 2. 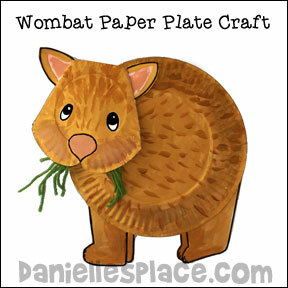 Have your children draw their own pictures of wombats or use the Printable Activity Sheet. 3. After they have colored their wombats have the cut up yarn into one-inch pieces and glue them to the body. 4. 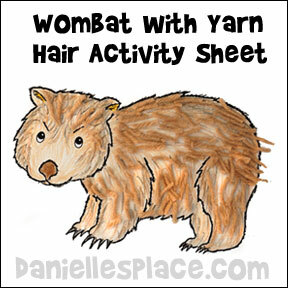 You can also have them write interesting facts about wombats on the sheet. 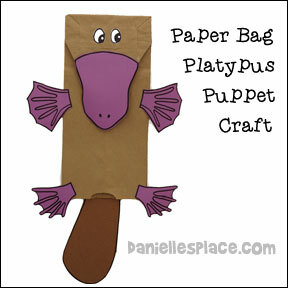 Use this Platypus Puppet Craft with your homeschool unit studies about Australia. Great preschool or elementary craft. See the suggested platypus books to go along with the craft. 1. 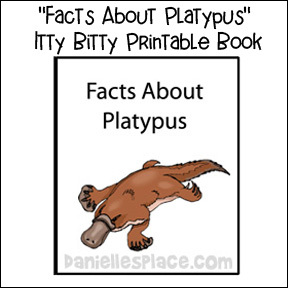 Print out the platypus pattern and make copies onto construction paper. 2. Cut a tail shape (pattern not included) from the same color construction paper. 3. Fold in the bottom corners of the bag as shown in the picture. 4. Cut out the patterns and glue them to the bag as shown in the picture to the left. Glue the bottom beak to the bag underneath the top beak. 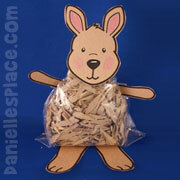 DLTK's Growing Together Web site has a Platypus Toilet Paper Roll Craft that preschool age kids will enjoy making to go along with this paper bag craft. This cute little critter is made from a child's sock and one finger cut from a glove. It takes only minutes to make. Stuff the sock, secure with rubber bands, and glue the tail closed. You can find complete directions for this craft on the Sock Crafts Page. Did you know that a baby platypus is called a puggle? *Platypus live in only Australia in bushland and rainforest. *They eat bugs, shrimp, and small aquatic creatures. from their prey's bodies, with sensors on their bill. 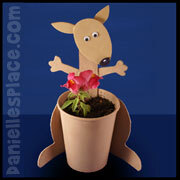 See the Kangaroo Crafts on other pages. Kangaroo "Tell Someone About Jesus Craft"
Echidnas are spiky little animals that live in Australia that look like a cross between an anteater, porcupine, and a hedgehog. Children will enjoy making a replica of these spiny anteaters and increase their knowledge of Australian animals in the process. 1. Cut the top part of four golf tees so that they are about 1 1/2" long. Press the cut tees into the egg to make the Echidna's legs as shown in the picture. 2. Paint the body and legs brown. 3. 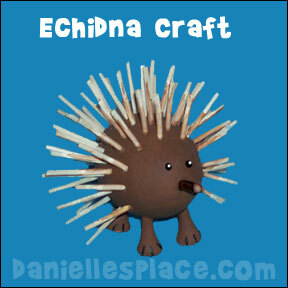 Break toothpicks in half and stick them in the Echidna's body as shown in the picture. Stick one of the cut off tee in the front of the egg to make the Echidna's pointy snout. Paint it brown and draw on eyes with a permanent marker. Children can Learn More about Echidnas on the San Diego Zoo web site. Aborigines originally used paint they made from natural items such as clay (Ochre) mixed with saliva, eggs, or animal fat. Children will enjoy trying to make their own paints. We used orange clay, charcoal, and pollen from sunflowers to make our natural paints. Other things they might use are crushed fruit and vegetables such as berries and beets. Have them paint with sticks that have been flattened at the ends. Rub the ends of the sticks on sandstone to flatten them. The Aborigines painted things that had meaning to them, to tell stories, and teach. Show your children the different symbols the Aborigines used (Links below) and ask them what symbols we use today. Have your children paint things that have meaning to using dot art techniques. 3. Aboriginal Dot Art by Kurun Warun - Kurum Warun demonstrates dot painting and explains the meaning of his painting. He also demonstrates how to play the didgeridoo. 4. Aboriginal Artist Judy Watson Napangardi - Judy demonstrates her dot painting 4. techniques using a series of dots to make thick lines. She makes very large paintings and sits on her canvas while she works. Make Your Own Dot Art Pictures. 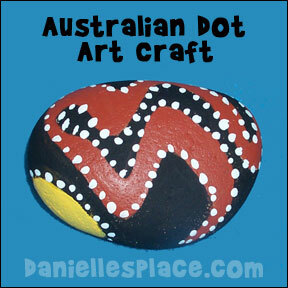 Study Aboriginal art and then make your own dot painting by dipping a stick, handle end of a paint brush, or your finger into tempera paint and place dots on your paper to make designs. Australian Aboriginals used sticks, Echidna quills, or spikes to paint traditional "dream time stories". Their paintings depicted stories from their lives. They usually used traditional symbols in their paintings such as: fish, turtles, crocodiles, snakes, kangaroos and other animals. They also painted pictures of weapons, boomerangs, and other tools they used. 1. Study Australian dot art designs. Decide what type of design and colors you would like to use. 2. Start by painting the lightest background colors. Fill in with the darker colors. Then add dots. Examples of dot paintings on Art-rageous.net. Aboriginal's used common objects such as boomerangs, their own hands or other's hands, feet, tools, spears, as stencils to make art. Make your own stenciled pictures. Add food coloring to small spray bottles filled with water. (Wear old clothes because food coloring stains.) Place your hand on a sheet of construction paper, trace around it with a pencil and then cut it out. This is your stencil. Place the "stencil" on another sheet of paper. Use the spray bottle to spray painting around the handprint. When you lift the handprint stencil the hand shape will stand out. 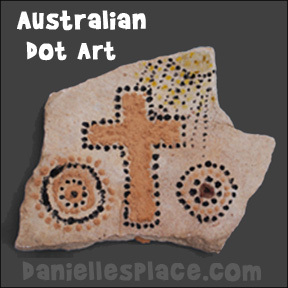 You can find out more information about stenciling at Aboriginal Art Online.